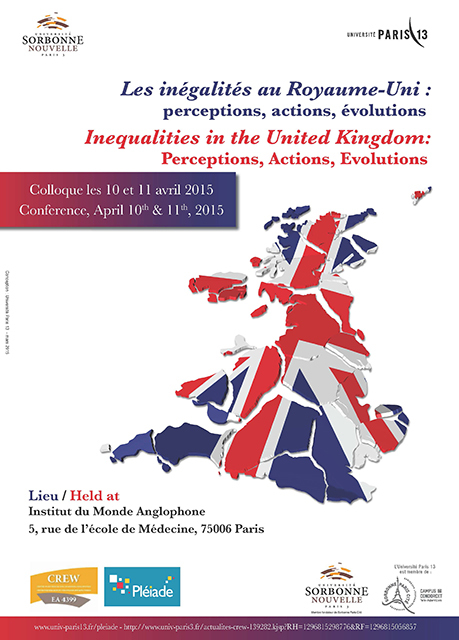 "Inequalities in the UK: perceptions, actions, evolutions"
The fight against inequalities was the priority of successive British governments for many years after the Second World War. As a result, the boundaries of public policy were gradually extended so as to include class inequalities, then ethnic inequalities and finally gender inequalities during the three decades that followed the end of the war. State intervention resulted in a broad and detailed legislative framework aiming at preventing or reducing inequalities in a large number of policy areas as well as in the field of public services. Those thirty or so years were marked by debates between proponents of equal opportunities and those in favour of equality of results. This egalitarian and interventionist model was followed after 1979 by a new one whose key features were its hostility to state intervention in the economic sphere and its reluctance to venture into the social one. Far from leading to legislative intervention, economic inequalities were extolled as incentives for social mobility and enterprise. As for social inequalities, they moved down the political agenda and were often defined as the outcome of different abilities between individuals. Consequently, the Conservative years of government saw widening inequalities. After coming to power in 1997, the Labour party did not fundamentally challenge this model and adopted an ambiguous position. Although the Labour years of government were characterized by a focus on social exclusion, as announced by the Borrie report of the Commission on Social Justice in 1994, economic inequalities seem to have been largely played down. In spite of a number of redistributive policies (Child Trust Fund, Working Tax Credits), the Labour party seemed to be more sensitive to Robert Putnam's theories in favour of greater social capital in deprived communities than to calls for greater equality made by the Sutton Trust. In sum, the Labour years were not marked by a return to the egalitarian philosophy of the 1970s Labour party. Instead, in an attempt to distance itself from previous Labour governments, New Labour underlined that inequalities did not matter as much as poverty and social exclusion. Its leader, Tony Blair, even went as far as to say that he hadn't gone into politics in order to make sure that "David Beckham earns less money". However, the end of the 200s and the beginning of the 2010s saw the issue of inequalities return to the fore in Britain, both in the academic and political world. Even before the end of the New Labour years, the publication of The Spirit Level in 2009, the polemical book by Richard Wilkinson and Kate Pickett reminded Britons how divided the UK remained. A few months later, in January 2010, the publication of the Hills Report also contributed to reviving the debate on inequalities, from an income and wealth perspective this time. Its publication also raised the question of the track record of the Blair and Brown years of government. In 2010, the Equality Act, by imposing on local authorities to demonstrate their intention to eradicate race, gender, religion, disability and sexual orientation discrimination seemed to indicate a return to a more interventionist approach in the social field, too. Finally, the election of Ed Miliband as Labour leader in 2010 as well as his statements on inequalities were perceived as a challenge to the dominant consensus in the political sphere and its toleration of inequalities. The onus put on inequalities since the start of the 2010s seems to point to a change in the political climate in Britain and in the perception of the evolution of British society. The issue of social exclusion, at the centre of the New Labour programme and of academic thinking in the 2000s, no long appears to be at the top of the political agenda. The criticisms levelled at the concept of social exclusion, once accused of providing a simplistic vision of British society divided between included and excluded citizens, seem to have won the day. In a tense context marked by the 2011 inner city riots, criticisms addressed at a Coalition government accused of widening inequalities since 2010 (in the housing field, higher education, welfare...), dissensions in the government itself and a lively debate around Thomas Piketty's Book, Capital in the Twenty First Century, it appears to be timely to organise an international conference on the question of inequalities in Britain. Participants may focus in their paper proposal on the concepts of inequalities, poverty or social exclusion. They may adopt a historical approach or on the contrary look at the Conservative-Liberal-democrat Coalition government's track record. They may decide to study the economic, social or political field. They may concentrate on the United Kingdom, or the nations of the UK or even base their analysis of the UK on international comparisons. They may also look at inequalities from a theoretical perspective or rather from an empirical and research one. These are only a few suggestions. This conference is the first in a series of two conferences organised by the University of Paris 3-Sorbonne Nouvelle (CREW) and the University of Paris 13 Nord (CRIDAF/Pléiade). The second one will take place in 2016 at the University of Paris 13. Les propositions de communication sont à envoyer avant le 31 septembre 2014. Please send paper proposals before 31 September 2014.